SHIV rebound is increased in transplanted animals following cART withdrawal. (A) Two groups of 5 animals were analyzed in this study. Prior to infection, baseline measurements were collected over 6 weeks. 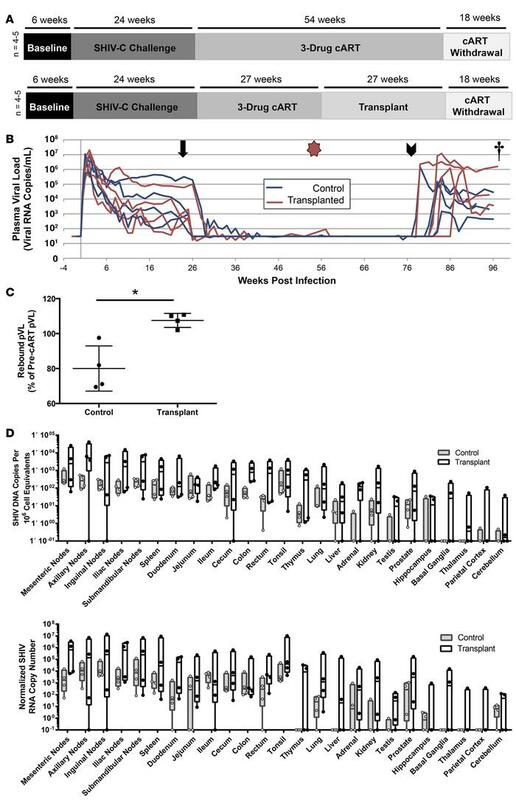 Following intravenous virus challenge with simian-human immunodeficiency virus 1157ipd3N4 (SHIV-C), infection progressed for 6 months prior to initiation of combination antiretroviral therapy (cART). Untransplanted animals (upper panel) remained on cART for approximately 1 year, followed by cART withdrawal and necropsy 15–20 weeks later. Transplanted animals (lower panel) were treated identically, except for hematopoietic stem cell transplantation conducted 6 months following initiation of cART, using autologous CD34+ cells cryopreserved prior to infection. One untransplanted and 1 transplanted animal were excluded partway through the study due to unrelated health issues; data were included where applicable. (B) At the indicated times following SHIV infection, plasma viral load (pVL) was measured by quantitative PCR (QPCR) from transplanted animals (red lines) or untransplanted animals (blue lines). Arrow, cART initiation; star, autologous transplant; arrowhead, cART withdrawal; dagger, necropsy. (C) Ratio of viremia following post-cART viral rebound to comparable time points during primary infection (see Methods). Data are the mean ± SD. (D) The indicated tissues were collected at necropsy from untransplanted (gray bars) and transplanted animals (white bars). Total genomic DNA and RNA were extracted for viral nucleic acid measurements by QPCR. Total SHIV DNA (upper panel) was normalized to a genomic DNA standard (macaque RNaseP p30, MRPP30). SHIV genomic RNA (lower panel) was normalized to the crossing threshold value of MRPP30. Boxes represent median and 25th/75th percentiles, and whiskers represent minimum/maximum values for 4 animals in each cohort. *P < 0.05 by 2-tailed Mann-Whitney test.